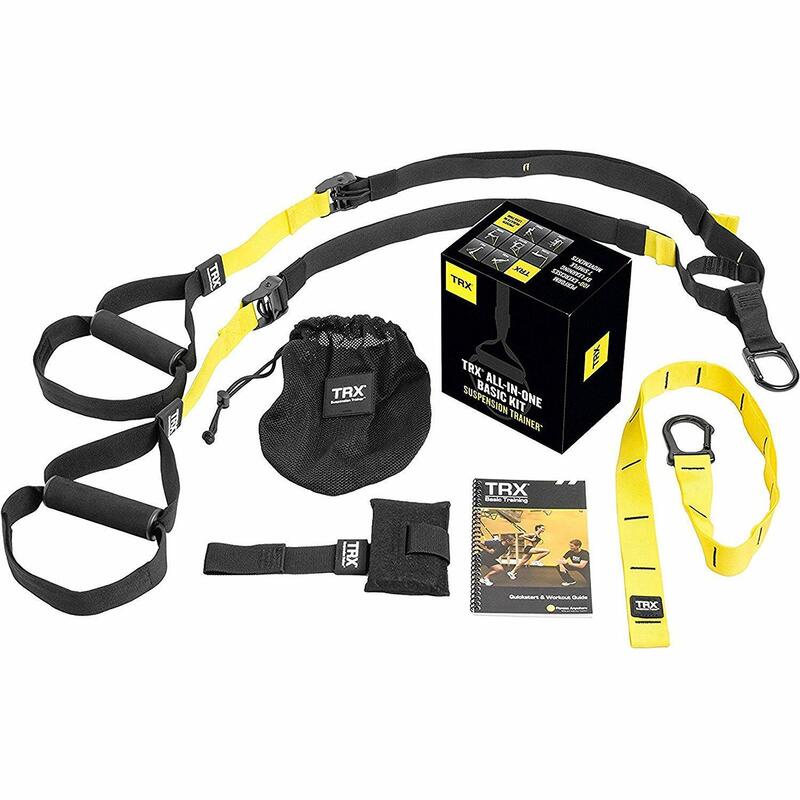 The TRX suspension trainer basic kit is an all-inclusive training companion for people of different ages and sizes. This training kit has been designed to cater to your workout needs whether at home or on the move. This 1.65-pound trainer is designed to hold up to 350 pounds in weight. The TRX Pro 3 Suspension trainer gets its name from the three different anchoring solutions that it provides its users. It incorporates ergonomic rubber handles in its design. These handles help to improve your grip and ensure comfort when working out. 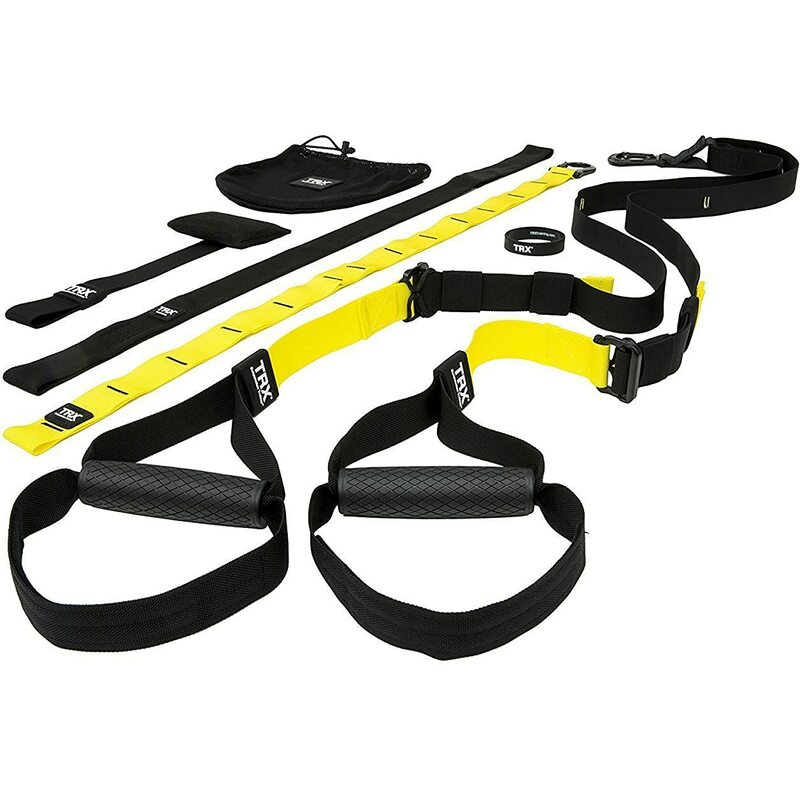 The TRX Go Suspension Trainer Kit is by far the leanest and the lightest in the TRX range of suspension trainers. It weighs a total of one pound. Its lightweight makes it the ideal training partner for both indoor and outdoor workout sessions. It is easy to set up, and the entire process will take you just 60 seconds to complete. As long as you have sturdy support on which to mount your training kit, you are good to go. The Lifeline Jungle Gym XT suspension trainer is designed for use by both professional athletes and newbies. This suspension training system makes use of your bodyweight to provide you with much-needed resistance training. The Ultimate Body Press Bodyweight Resistance Trainer is designed to make use of your own bodyweight to give you an effective workout experience. 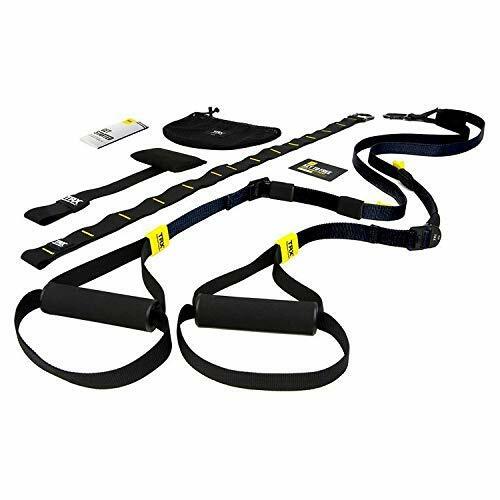 This suspension trainer comes with two indexed suspension straps that can be easily adjusted as needed. 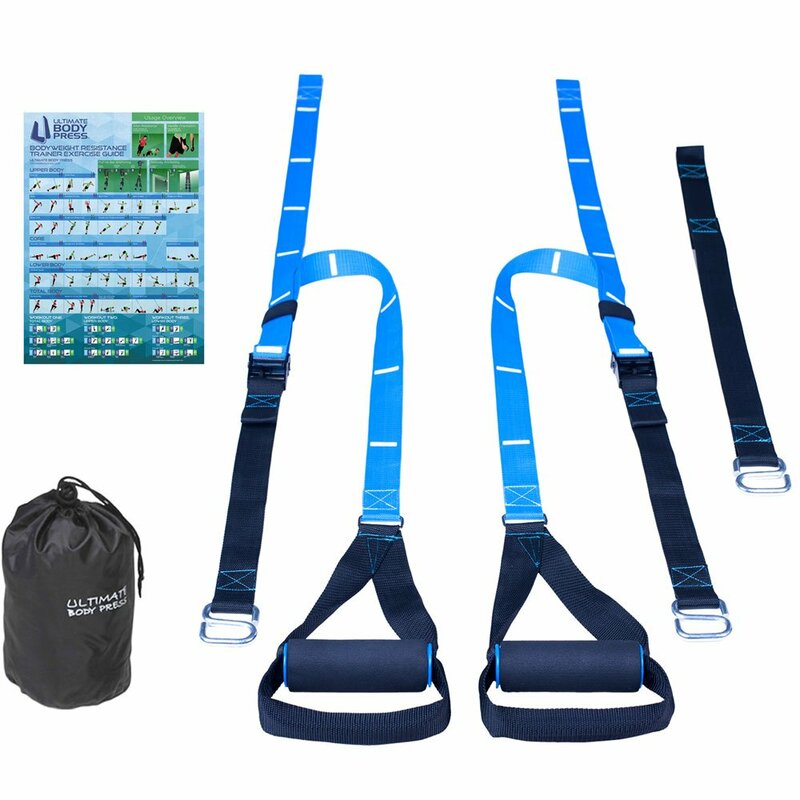 The training kit includes a suspension training strap, a suspension anchor, a door anchor, a mesh carry bag as well as a workout guide that is 35 pages long. The kit also includes two extra workouts namely – The TRX metabolic blast and The TRX endurance circuit. You can harness this suspension trainer for an intense body workout. This training kit is easy to set up and takes up very little space when fully set up. The all-round trainer helps users not only burn fat but build muscles, increase their endurance while improving their flexibility. Be careful, however, to use the door anchor on a sturdy door. Failure to do so will lead to damaging your door due to the strain exerted on it by your weight as you workout. If using it indoors, the training kit comes with a door anchor to help you set it up. Be sure to use it on a sturdy and durable door to avoid damaging it due to the strain exerted by the weight of your body as you workout. If you are planning to use it outdoors, then be sure to make use of the suspension anchor that is provided in the package. To help you workout and shed off that unwanted fat, this trainer kit comes with a poster that has easy to follow instructions for a 20-minute workout. The free mobile phone application helps to guide you through over 300 versatile workouts. These workouts not only get you to burn fat but aid you in building lean muscle mass. It also helps improve the strength of your core. The Ultimate Body Press Bodyweight Resistance Trainer is designed to make use of your own bodyweight to give you an effective workout experience. 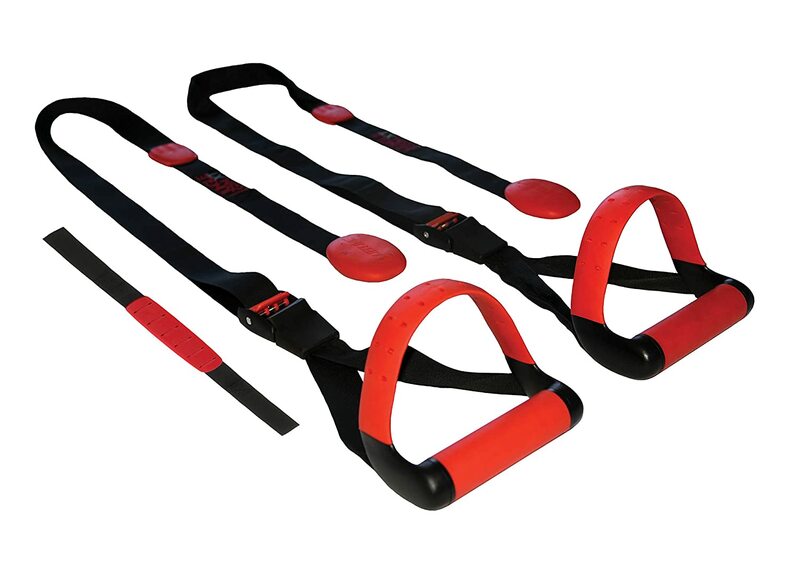 This suspension trainer comes with two indexed suspension straps that can be easily adjusted as needed. It also comes with a universal carabiner anchor strap, high strength handles and accompanying foot loops, as well as heavy duty cam buckles. The anchoring strap can either be used for single-point or multi-point anchoring. This trainer makes use of lay-flat hardware and handles to keep the body from coming into contact with the straps and buckles as you work out. As a result, you end up with a smooth and comfortable workout experience. This trainer is also suitable for both indoor and outdoor workout sessions. To make it easy to transport from one place to the next, this bodyweight resistance trainer package comes with a drawstring bag. To get you started on the workouts, the package comes with a poster that provides easy to follow instructions on 26 different exercises and three sample workouts. This trainer kit helps you not only burn fat but work on your core strength as well as pay attention to both your upper and lower body fitness needs. With this suspension trainer, you can target muscles in every part of your body, have a full body fat burning workout experience, improve the strength of your core as well as your body’s flexibility. Its split anchor design allows you to incorporate different angles into your workout session adding to its versatility of use. Like other TRX suspension trainers, this one is suitable for use both outdoor and indoors. You do not have to worry about space as this trainer takes up very little space when it is set up and stored. Weighing at about two pounds, this suspension trainer is stronger than most in this product range. It is easy to set up and use. The trainer kit comes with an eight-week workout guide that helps you to not only get rid of that stubborn and unwanted fat but to also build a stronger core as well as lean muscle mass. The half an hour total body workout, and the five body-part workouts will go a long way in improving your body’s flexibility, endurance, mobility, durability, and stability. The extender straps come in both gold and black giving you the freedom to choose that which works for you. The different best suspension trainers come with varying advantages and disadvantages. Of the trainers reviewed in this article, our choice has to be the TRX suspension trainer basic training kit. This suspension trainer is not only great for getting rid of that stubborn fat but for your all round body fitness. While some may find it to be rather costly, we like that it is space friendly, easy to use, and caters to users who weigh as much as 350 pounds. The full-color training guide is also a plus as it starts you up on your fitness journey with easy to do workouts whose complexity increase with time. The instructions in this guide are also easy to follow making them user-friendly. Suspension trainers are a great way to keep fit in the comfort of your home or whenever you are on the go. Due to the busy and demanding nature of today’s life, it is important to have the freedom and flexibility to workout where you are. Be sure to compare and contrast the different options available in the market to find the best suspension trainer for your needs.